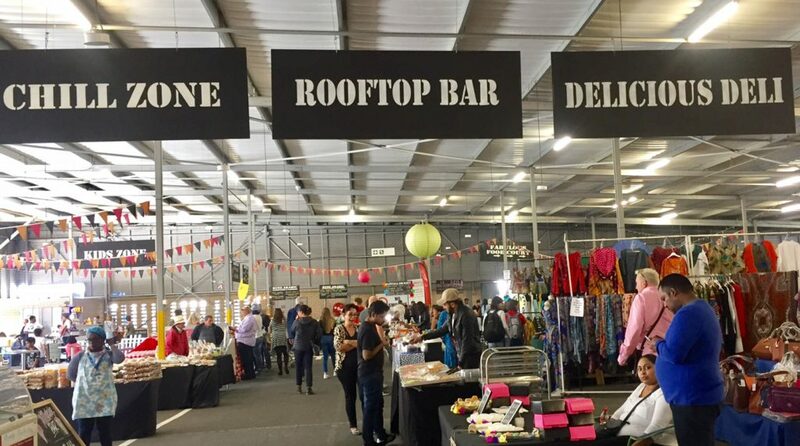 The Rosebank Rooftop market is back and it’s better than ever! 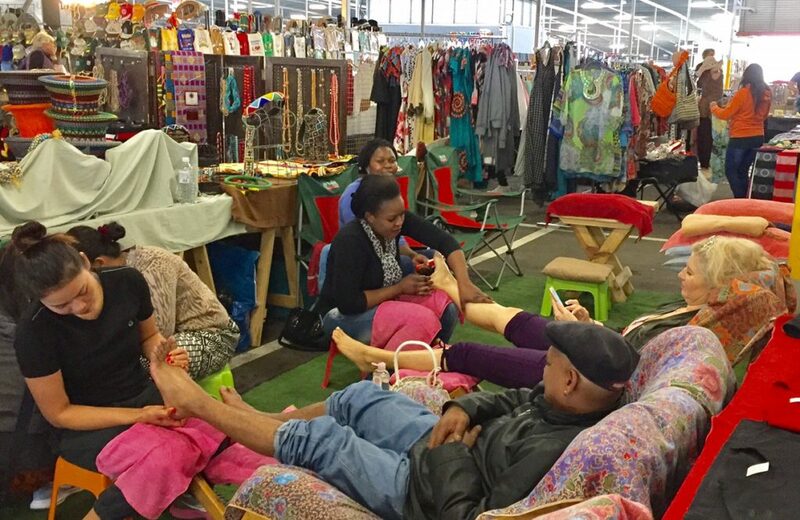 What used to be called the Rosebank Rooftop Market is now the Rosebank Sunday Market and it’s a fabulous place to browse, eat, drink and relax, and … if you’re like me, …. buy … on a Sunday morning. 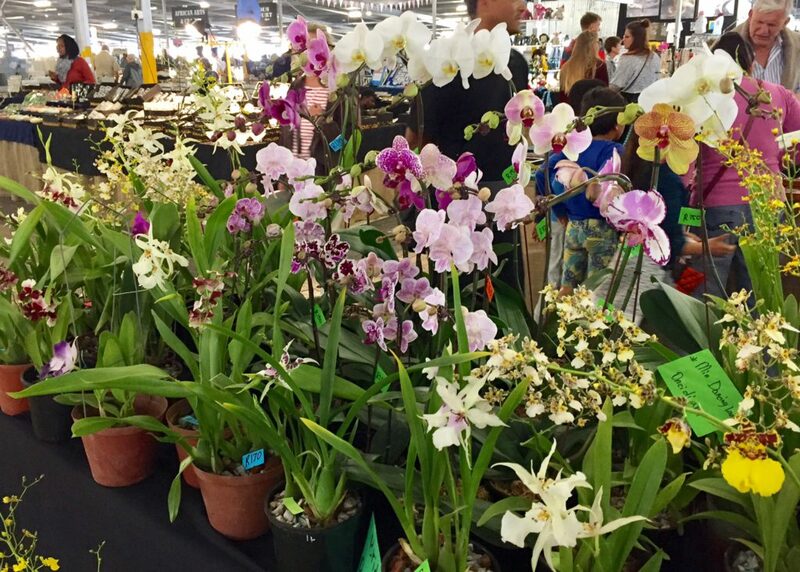 It is much better laid out than before – more spacious and with the different sections well sign-posted – from the Food Court to African Curios to Vintage where there’s lots of vinyl on offer as well as bric-a-brac and second hand trinkets. 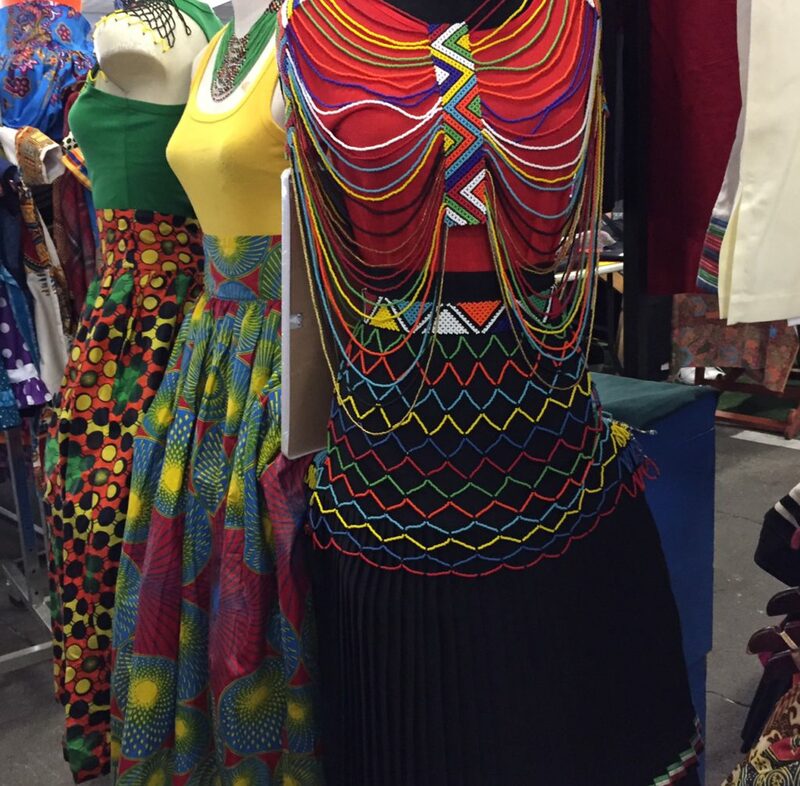 Visitors to Joburg can get some great African curios, clothing and accessories. There’s live music and some wonderful buskers – Sunday saw a trio of fun tap dancers. Stay at our well located Guest House and visit the Rosebank Rooftop. View our Rosebank Guest House for Rates and Availability! 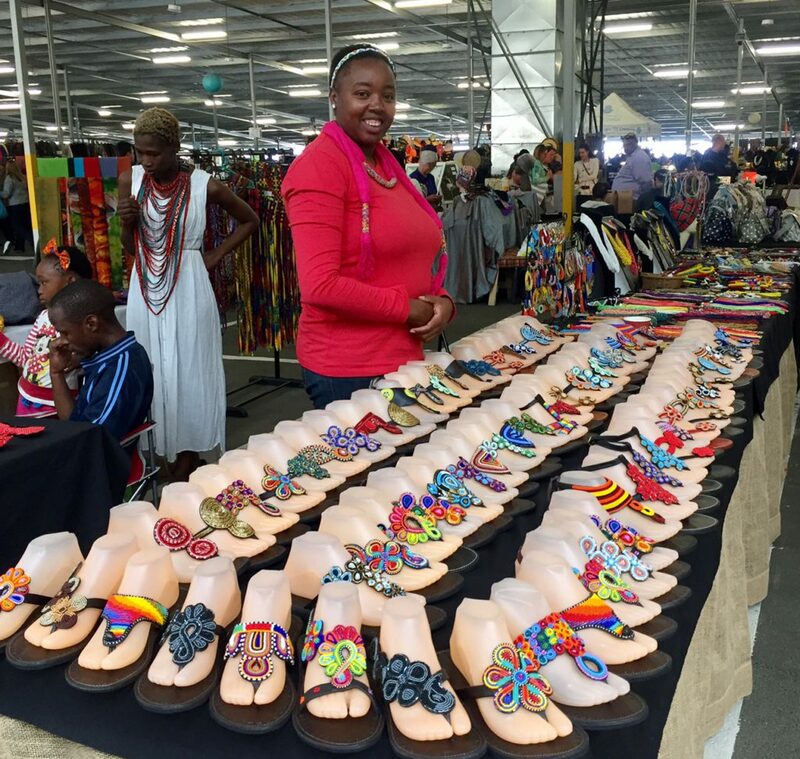 Fridah Gatuhi of MaasaiWorld will take special orders for her designer Kenyan beaded sandals – some were a bit too ornate for my taste but I loved the plainer geometric designs. 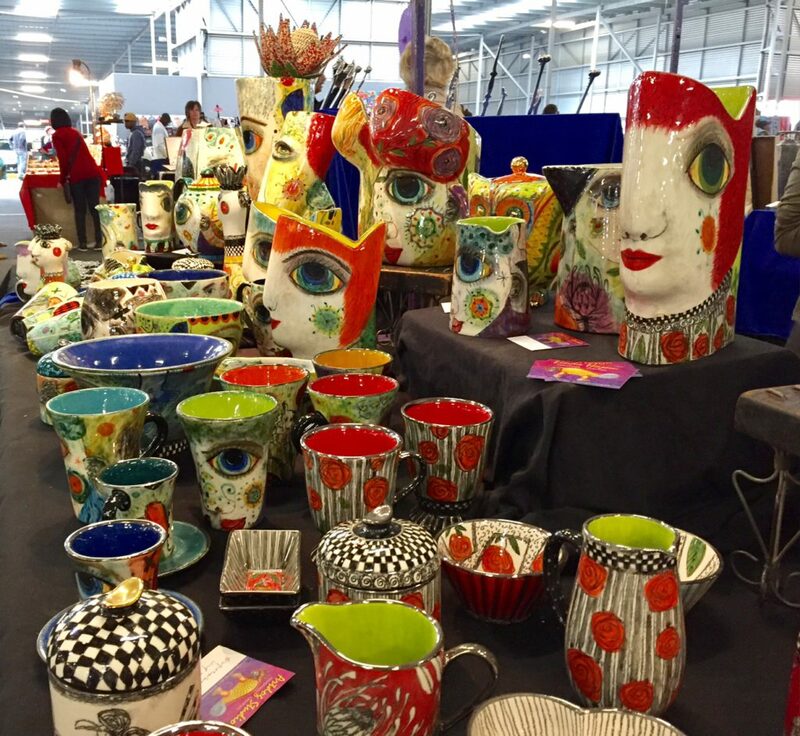 There are a number of ceramic stalls. 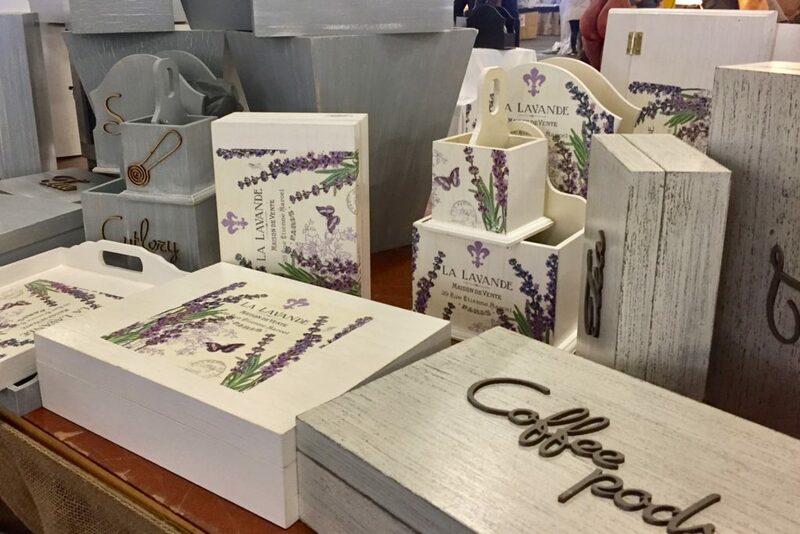 I stopped at one and asked the stall-holder if she could make me a covered butter dish to fit a South African 500g size butter (not a truncated Chinese size …. grrr!). It turns out she studied art history at Wits some 30 years when I taught there. So Linda Hojem … I’m waiting for a beautiful colourful ceramic butter dish from you! There are fabulous painted enamel teapots, watering cans and little buckets by husband and wife team T and T Weya art. 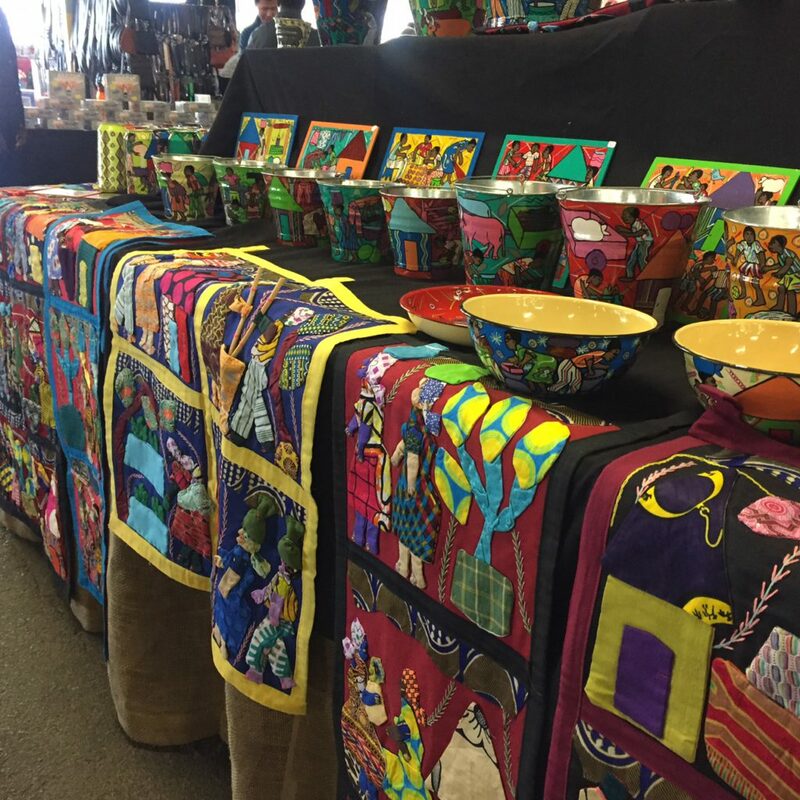 Tendai’s wife makes the Weya applique panelled hangings – all of which tell a story. I passed a man with some curious small ridged plates. He proceeded to grate a huge garlic clove … tjoep-tjoep; then a piece of fresh ginger … faster that Jamie Oliver would be able to say ‘wicked’. And with a professional flourish he reduced a piece of parmesan into fine dust ‘for your pasta’. Who could resist a salesman like that? 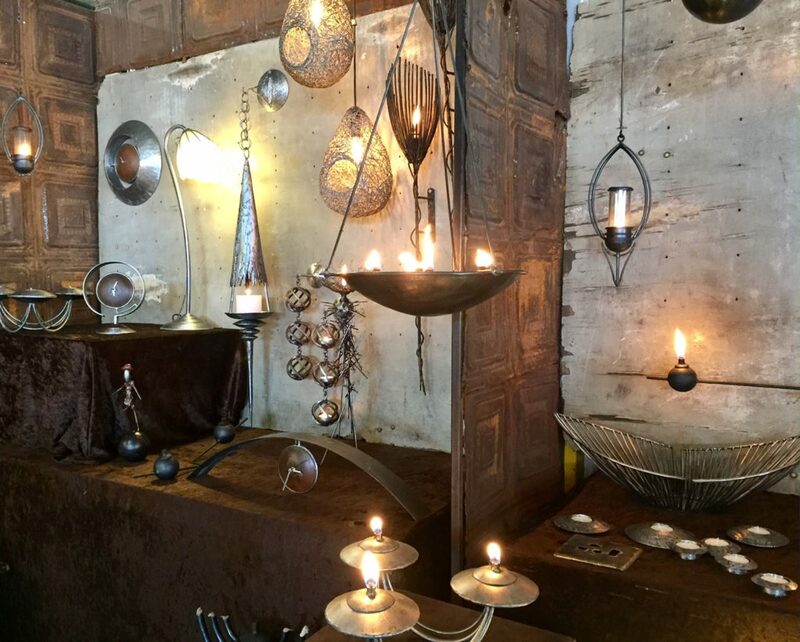 Chevy Borchowsky Design has a whole range of designer oil lamps. While not all were my taste, I could see many of them lighting up pathways and courtyards at Liz at Lancaster. 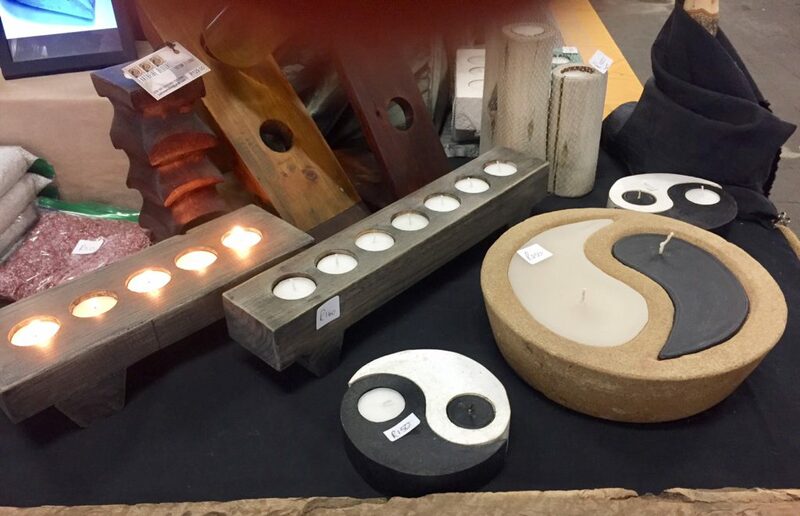 How’s this Yin Yang candle with handmade container. When the wax runs out you can use wax beads. Simple, stunning and at R200, very reasonable. And I swooped on a Senagalese man selling drums and told him the sad story of the skin of my Djembe drum having split. ‘No problem’ said Ousseynou, ‘Bring it to me, I’ll fix it’. So I guess serendipitous meetings are the upside of a place where a whole lot of ill-disciplined impulse-buying is the order of the day! And the food stalls … well that’s a whole other story. I couldn’t resist a chicken roti and the most sublime Sri Lankan vegetarian curry. 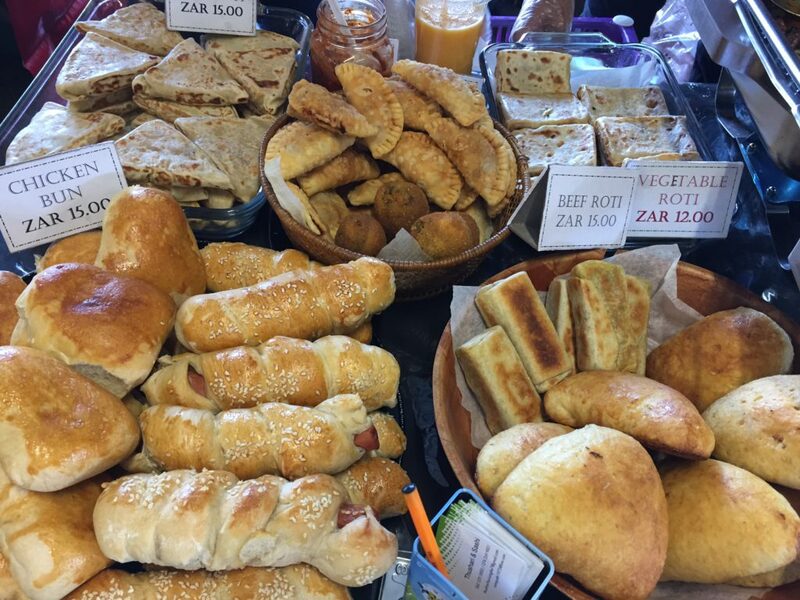 There are breads, cheeses, cakes, preserves and sauces and food from every corner of the earth from Thai to Indian to Greek to burgers to Moroccan, you name it. 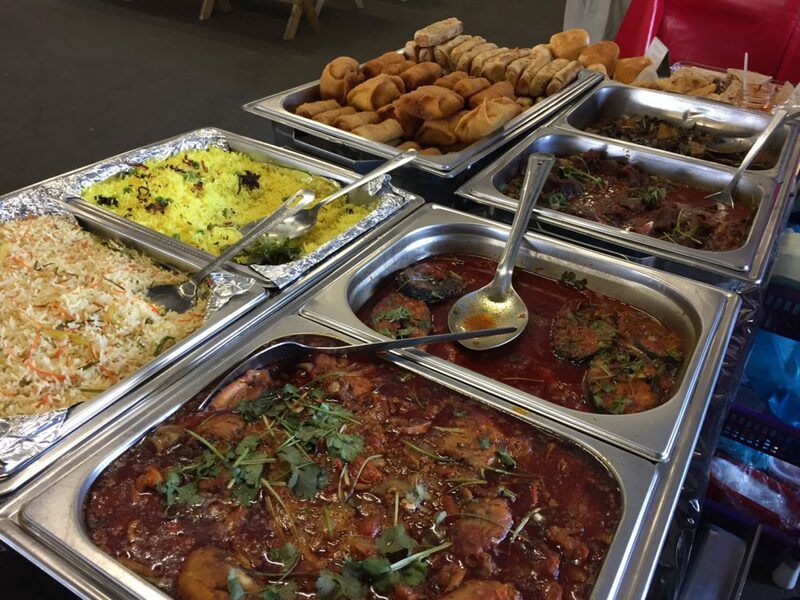 Don’t go on an empty tummy … you will be tempted by every aroma and visual delight. I have to go back to take my drum to be fixed, and I will try to resist temptation but wowsers- it’s hard! And when the going gets tough, the tough can go for a massage to get ready for the next leg of retail therapy. 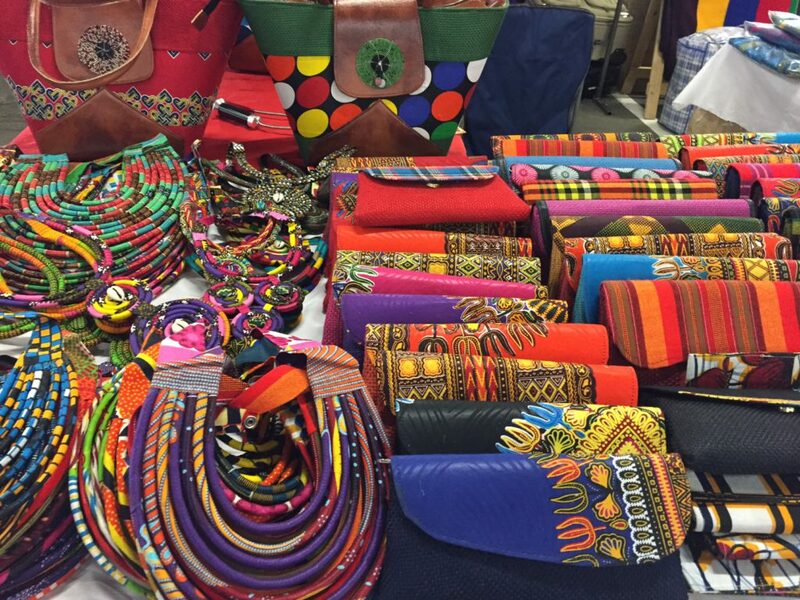 your article and great photos encourage me to re-visit the Rosebank Sunday Market and I will make a point of seeing the stalls you mentioned. My last visit, earlier in the year, was rather discouraging. I like your enthusiasm. Thanks Anneliese. I went very early on after it re-opened and was also not that impressed but I think it is really on the up-and-up again. I have guests from the US staying and they went yesterday and LOVED it. Thanks as always for your great feedback. Keiskamma Art Project II: Tourist potential for Hamburg?